I have had a cold for the last three weeks! It started with a sore throat, runny nose, cough and a combination of all of these. My nose has been so runny the past couple of weeks that if I were of the canine persuasion, I would be healthy enough to win Crufts! The prospect of cycling for over 40 miles in rain might not be the best of things to have done in the circumstances but feeling it would do me good, I set off bright and early for Paddington. This particular location has of late been a slight nemeses of mine. This you may recall was because of the quite shocking way I got lost attempting to get to the Edgware Road only a few minutes away. I am glad to say that I made it there without incident! I met David and Anne and a few of the usual suspects and a few new ones. Before long we were on the 09:18 bound for Reading. The journey didn't take too long and just before 10:00 we reached our destination. Apparently Reading Station has had a great deal of money spent on its upgrade. I have to confess not seeing evidence of this from the small part I saw but then I didn't really look far. Our ride leader Bob greeted us at Reading. It was good to see him again and great that he has devised this ride for us. As we waited for the off the heavens opened and the waterproofs started to come out. The forecast was right and rain was to be our companion for a great deal of the ride. Setting off, always the best part of a ride there were 16 Bromptonians. As always this must have been an amusing and intriguing sight. The rain fell but this did not dampen our spirits. Unfortunately with less than fives miles under our collective belts we suffered our first puncture. Bob made quick work of getting the rear wheel off while we took sanctuary under a nearby railway bridge. I suspect all were thankful for that. We weren't that much further down the road when we heard that another of out number suffered a similar fate. This time some of us took refuge in a bus shelter. It was here that talk turned to weather forecasting. The Met office it seems is yesterdays man as the Norwegians also predict the weather and seem to do a better job at it. Reaching Ascot we stopped briefly but the group decided to press on for lunch. While we waited outside Costa a very nice lady brought over a tray of various Christmas cakes. She had first offered these to the general public but many seemed uninterested. Her bringing them to us induced a frenzy of activity. The only thing I can liken it to is a pack of wolves surrounding the caracas of some poor creature. Singing the praises of Costa's Christmas cake selection we headed off again. There were times on this ride when cycling in a large pack where the riders bunched up together but still rode at speed. It reminded me of the Tour de France and riding in a strict peloton. Riding through Windsor Great Park was picturesque even whilst raining. There was opportunity for some speedy cruising on the long open stretches. With a slight change in route we headed for the familiar location of the Monkeys Forehead in Egham. Once inside we could see the sky clearing. The sun started to come out. Those with the Norwegian weather forecasting iPhone App saw the sun symbol and might have been given to thinking that the rest of the ride was going to be rain free. I took off and packed away my over trousers. Just as we were about to head off the heavens opened again. Over trousers were put back on and off we went into more of the same. Following the Thames path we encountered mud. 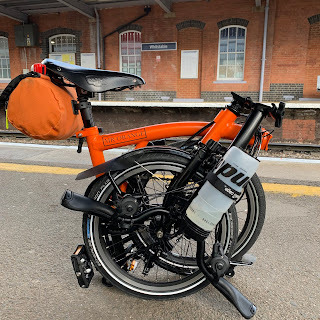 I was regretting taking my beloved Titanium Orange Brompton! There was so much of it! So traumatised was I of the prospect of riding it through a near lake of a puddle, I got off and carried it. Mud to the left of me! Mud to the right of me! Mud in front of me!! As I cycled through this I was already making plans for how I was going to put this right! Arriving back at Richmond a few of us made straight for the trains and home. This was a really good ride and the rain didn't really do anything too drastic to alter this. It was great to see some familiar faces and some new ones. It also marked one of the largest turnouts of Bromptonians for some time. Many thanks to Bob and I hope that he is able to come on and perhaps lead more rides in the future. In case you are wondering one of the first things I did when I got home was to wash down all the mud off my bike. I suspect that my Titanium Orange Brompton might have to be retired for winter at some point. As soon as salt is put on the roads I think I am going to be using my Original Orange Brompton. Thanks for the write up. Why would you use the steel over the titanium in the winter? I thought the titanium would better handle rust prone conditions? You are of course totally right. Just me being precious about it I suppose.